Who is In The Tub? use a hot tub cover and also to lock it with the provided keys. Most hot tub covers have cover locks and tie down straps so even gusty winds and passing lions can’t get into the tub when you are not home. 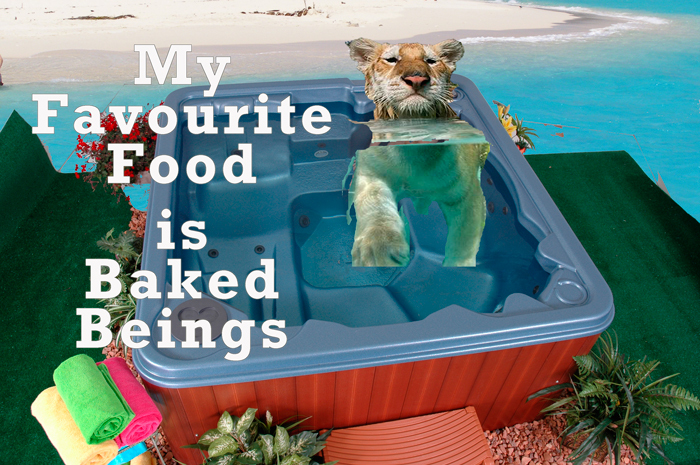 Keep the lions out with a good hot tub cover. Thicker covers may need a cover lifter as well. Cover lifts are available at HotTubOutpost.com in the States and online in Canada. Cover Butler is a popular type of cover lifter where a bar goes all the way across the cover and makes lifting it with one hand a breeze. Once you have spa steps, a cover lifter and even an LED light bulb, add a dash of aromatherapy liquid and drift away into the world of relaxation and rejuvenation. Once you’ve purchased the prefect hot tub for your backyard oasis, you’ll want to enjoy it as often as you can. Having a spa right in your home can afford you great convenience by being able to use it whenever you want, all year round. In order to continue to get enjoyment from your spa, you need to buy hot tub chemicals to maintain the cleanliness and safety of the tub’s water. Having properly maintained water through the use of these chemicals is best for both the spa’s occupants and the actual hot tub itself. How Do Hot Tub Chemicals Work? The main reason for placing chemicals in the hot tub is to make sure the water is kept clean, clear, safe and free of harmful bacteria and micro-organisms. Maintaining a certain chemical balance is essential to have safe water to soak in. Certain elements should be measured on a regular basis, such as the pH level, the calcium levels, and the alkaline levels. If one of these components is not in proper balance, the water can suffer. It can become cloudy, and develop green algae. On the other hand, the water’s chemical makeup can cause irritation to people’s skin and eyes. What Types of Hot Tub Chemicals are Best? Chemicals used to keep spa water healthy include chlorine and bromine, which tend to be the most popular chemicals for spas and hot tubs. These chemicals work by creating an oxidizing layer in the water which assists in killing harmful bacteria, fungus and other microorganisms. These chemicals purify the water and the tub entirely. It is essential that these chemicals are added to the water at appropriate intervals and levels to make sure the water is kept clean and safe, and chemical levels are kept in proper ranges. When you need to buy hot tub chemicals for your spa, visit HotTubOutpost.com for a vast selection of chemicals and other tools necessary to keep your tub operating at optimal level, and to maximize your enjoyment of your own personal hot tub. Take advantage of their factory direct prices, and their wide selection of pool and spa chemicals, or even bulk spa supplies today! Enjoying warm, therapeutic, bubbling water in your own spa in the comfort of your home or backyard is a luxury that many homeowners enjoy. In order to maintain and keep up this enjoyment, it is important to make sure that the tub water is kept clean and sanitary. Nothing spoils a hot tub experience like the presence of dirty, bacteria-laden tub water. Hot tub chemicals are necessary to keep the spa water clean and free of harmful microorganisms and bacteria. 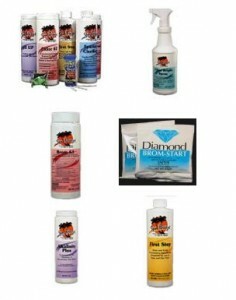 When you are running low on water chemicals, it’s time to stock up again, which can easily be done by shopping online. 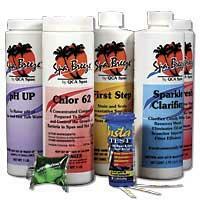 The two most common types of sanitizers for your hot tub or spa are chlorine and bromine. In general, bromine seems to be the more popular of the two. Regardless of which sanitizer you choose, it is important to keep them at appropriate levels to ensure that your water is clean and safe enough for the hot tub’s occupants to be submersed in for any length of time. The actual levels of these two chemicals differ slightly – chlorine levels should be around 3-5 ppm, and bromine levels should be 3-4 ppm. Different forms of each chemical are available on the market, depending on your needs. For example, chlorine should be added to the spa on a regular basis in order to keep the chlorine at acceptable levels. If you are not able to remember to regularly add chlorine to the spa water, then you may consider purchasing chlorine tablets that sit within the water and dissolve at accurate rates to release the appropriate amount of chlorine into the water to keep it sanitized. Even if you are diligent at putting chemicals in the water at proper intervals, it is still essential to test the water and chemical levels of the spa on a regular basis to make sure no adjustments need to be made. This testing can be done in a few different ways, but the easiest way is probably by using test strips, which will identify if the spa water is too acidic or too alkaline. Considering how important it is to keep your hot tub water clean and sanitized, it is a good idea to buy spa chemicals online from credible suppliers who deal only with high quality products. When you shop with HotTubOutpost.com, you can be sure that the products you are getting are high in quality. They also carry pool and hot tub repair parts and accessories, as well as top name spas. By shopping with HotTubOutpost.com, you get factory direct prices and product delivered right to your home. Combine these low prices with their free shipping policy (on pools, spas and large orders) and save a ton! Visit their website today, and find everything you need for your hot tub and spa, including spa chemicals to keep your hot tub sanitized year round. 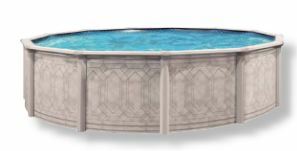 Shop 24/7 with www.hottuboutpost.com. Deciding on getting a pool for your backyard is a big decision, especially if you go for the expensive in-ground type. In-ground pools are a huge commitment, since you are excavating a lot of dirt and sod out of your yard. In addition, they are extremely expensive, and run into the tens of thousands of dollars, depending on the extent of the depth and landscaping. Round above ground pools provide pool lovers with another option. They are much less expensive, and don’t require the permanence of digging up to 9 feet below your ground level. In addition, their portability allows you to move them from one spot in your yard to the next, or pack it up with you if you decide to move. Round above ground pools can be purchased in a variety of sizes to help fit in even the smallest backyards. The round shape provides more water surface for occupants to swim around in, therefore maximizing swimming space. Rather than waiting weeks to have your in-ground pool installed, above ground pools can be up and running within a couple of days. In fact, the do-it-yourself person who is a bit handy may be able to install the pool him or herself without having to employ the services of a pool contractor. Before you select your pool, you need to keep a few things in mind. First of all, the model that you purchase needs to be made out of good quality material. Cheaper models will break apart more easily, and show signs of wear and tear earlier than others. Of exceptional importance is the pool’s liner. You must ensure that you get a pool that has at least 20 mil- 100% virgin vinyl liner that is non-embossed. Ensure that the 20 mil vinyl is not only reserved for the walls, but also along the flooring. Many pools may have 20 mil vinyl along the walls, but only 16 mil on the floors. Having a good quality liner will be resistant to tearing, fading, ripping, shrinking and stretching. When you’re ready to buy round above ground swimming pools, make your purchase from a reputable and experienced supplier like HotTubOutpost.com. Their track record speaks for itself and now you can get free shipping too! Get your pool from HotTubOutpost.com and see why they have a long list of satisfied customers. Limited on space in the backyard but still have dreams of owning your own pool? The beauty of above ground pools is that you can set them up anywhere and they don’t take up your whole yard. Above ground pools are available in a multitude of dimensions to fit your space requirements and offer the same enjoyment as in-ground pools. Buying a round above ground pool has its advantages. They cost a tenth of the price that your average in-ground pool costs. Installing an above ground pool is as simple as picking the spot in your yard and putting it together. You can be swimming in your new pool the same day you purchase it. In-ground pools can take weeks to install and having to deal with heavy machinery and construction is never fun. Above ground pools are easy to clean and maintain due to their height. You don’t have to worry about the daily cleaning of plant matter and dirt or fishing out critters that wander in. There are covers that can be placed over your pool with ease to keep it clean and ready to swim in. If you have small children, above ground pools offer the added comfort of safety. In-ground pools are so accessible that anytime a child (or pet) is in the backyard, they can easily slip in. Once they are in the pool they are always tempted to get in the deep end. Supervising kids around a pool can be stressful. In order to get into an above ground pool, you need to access a ladder. Most children need assistance getting in and that means you can control when and for how long they remain in the pool. Above ground pools are uniform in depth, which means there is no deep end or shallow end. There is no risk of children slipping into the deep end without supervision because there isn’t one! They also can help with the resale of your home. Most people do not want to be burdened with the maintenance and costs that come with an in-ground pool. You can even take the above ground pool with you when you move. So if you are considering the addition of a pool to your home, remember the benefits of an above ground pool. Don’t waste this summer dreaming of swimming, get a pool for less money and enjoy the heat. 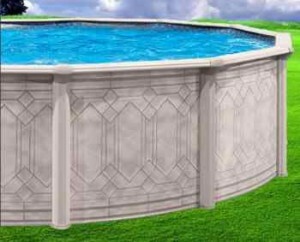 Buy above ground pools online with www.hottuboutpost.com and get all your needed accessories, factory direct pricing and free shipping. If you find yourself in need of a vacation but can’t find the time or the money, a spa might be the solution and your special escape for the coming years. Why go half way around the whole when you can take a vacation from your daily life on your own property? There is no need to go to a crowded gym or pay overpriced fees at a spa to soak in a hot tub – they are affordable and are a great investment for your home. Newer hot tubs offer the latest technology for optimum hydrotherapy, allowing you to pop in and out as you see fit. Relax those tense muscles after a long day’s work or throw a party and invite all your friends -spas are multifunctional and fun for the whole family. With a myriad of options as to what kind of massage you want, how many jets you prefer, the number of seats, and even an energy smart system, you can choose your own hot tub to your exact preferences. The internet has changed the way we research and purchase goods and this amazing tool is no different when it comes to purchasing a hot tub. HotTubOutpost.com offers customers an easy and informative way to shop online for their dream spa. With over 50 models made in North America and a wide availability of parts, accessories, and options, you can research and put together the spa you want at any time of the day. You can also customize your spa by adding LED lighting, a built in stereo system and more. Customer service agents are standing by to take your calls or start a chat session in an effort to give you the expert service you need without the commissioned salesman on the other end. Purchasing from a factory ensures that you are getting the product you want at factory direct prices. This means no mark ups or added fees – you can buy discount spas online, directly from the manufacturer. The best part is that companies will offer you free shipping on your spa purchase. So that is factory direct prices; noncommissioned service experts, full choice of models, colors and accessories; all the information you need to make an informed choice, and free shipping. Save your money and time – buy your spas online. Many homeowners have the luxury of owning their very own hot tub that they can come home to every day after work to simply relax and unwind. This is not necessarily a luxury that only the wealthy can afford – there are fantastic quality spas available on the market at very affordable prices. Just about anyone can enjoy their own spa. Those who do own one know that there is some degree of care and maintenance involved in owning a hot tub. As time progresses and wear and tear becomes evident, there may come a time where certain parts of the hot tub will need to be either repaired or replaced. When you find yourself in this situation, trust the experts at HotTubOutpost.com to supply you with top quality spa parts in addition to spa chemicals and water maintenance supplies. Jets – The jets are what propel and move the water through the shell of the spa. Without properly functioning jets, you will be sacrificing a good therapeutic hydrotherapy session. The pressure from the jets is what gives the occupants of the hot tub a soothing, relaxing massage. If the jets are not performing to their expected level, they may need replacement, which can be done quite easily. Price and quality of jets range greatly, depending on your budget and needs. Heaters – The heater is an essential component of a hot tub. Part of the reason for submersing yourself in the water is to feel the warmth of the water provide soothing relief to tired, aching muscles and joints. Heaters come in both electric or gas fueled versions, depending on what is most convenient for you. Most tub heaters sense the water’s temperature and adjust accordingly as per the user’s controls and specifications. The best ones on the market are energy efficient so that you can save on your utility bills. Water pumps – These are another very common component of a hot tub that may need repair or replacement at some point over the life of the spa. These pumps work in conjunction with the motor and jets to send water throughout the hot tub. The better quality pumps offer 2 speeds for efficient operation. It is recommended to make sure that the parts you are buying for your spa are good quality so you don’t have to replace them too often. 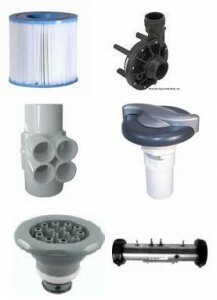 When you buy hot tub parts from HotTubOutpost.com, you can be sure that you are getting quality products. When your spa needs replacement, you can also get factory direct pricing and free shipping on a new QCA Spa. QCA has been manufacturing quality spas and spa parts since 1966, so they have plenty of experience and a very good track record. Visit their online showroom today and find the perfect spa or spa part for replacement on your hot tub. You don’t necessarily have to spend a lot of money to buy your very own hot tub spa if you know how and where to shop for them. Buying factory direct hot tubs is a smart way to purchase them because of the elimination of the middleman, and the avoidance of paying a mark-up from retailers. Browsing and shopping for hot tubs directly from a reputable manufacturer online, such as QCASpa – a leader in aqua technology since 1966, has many advantages for the consumer. One of the biggest advantages of purchasing a hot tub online directly from a manufacturer is the lower purchase price. You could potentially save hundreds of dollars by shopping factory direct rather than buying from a conventional retailer. Manufacturers who deal with the public are selling their products at lower prices than their retailing counterparts. This is because retailers charge a premium on their products in order for them to profit, pay overhead and commissions. By eliminating the middleman, the consumer is able to save quite a bit of money. There is no better way to shop than sitting at home, without having to waste gas and time traveling from one store to another. In addition to saving time, you do not have to deal with any salespeople who may be working on commission and possibly push you into making a sale for them. When you shop online for factory direct hot tubs, you can gather all the necessary information you need on specific hot tubs without having to deal with any salespeople, or exerting energy to hop from one store to the next. The selection you can find online is much greater than what you would find in a showroom at a store, as not all available models can possibly be put out on display. It is so easy to compare different lines and models of spas online by referring to charts and spa specifications the manufacturers’ website provides. For example, QCASpas.com supplies charts on specifications for their tubs, making it easy to compare each model to each other. Simply spend a few minutes browsing online and find a variety of different types of well-built hot tubs in every budget to meet your needs. Buying online also lets you pick your shell and cabinet color, as well as accessories. You can customize your spa with a built in stereo system, LED lighting and more. 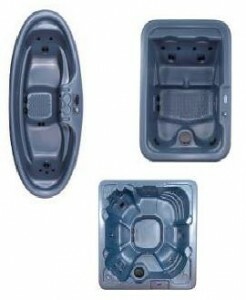 If you order your QCA spa through www.hottuboutpost.com, you can also get free shipping! Buy an American built spa, backed by a comprehensive warranty, and have it delivered right to your door at the best prices! If you are wondering what the difference between a cheap spa and discount hot tub is, the answer is quality. Low end spas are typically made of substandard materials and the low price reflects that quality. When you purchase a discount spa, you are paying less but are buying a high end product. This can raise another question – Why are these high end spas discounted in the first place. High end hot tubs can be purchased at a discount when you get them directly from the manufacturer. The discount you receive is based on the fact that you are not paying for retail inflation. This means you can purchase the spa you desire for a price you can afford, all the while avoiding the middleman of retail. Cheap, low end spas are made of less durable materials, often vinyl. Vinyl is not as durable as acrylic – which is what high end spas are made of it. Vinyl can fall victim to wear and tear and the chemicals used to clean your tub can leave it discolored and unattractive. Acrylic is resistant to these chemicals and the high end hot tubs can utilize water cleaning systems that use salt instead. The spas recycle the salt and keep your tub sparkling clean and fresh without a consistent dose of expensive chemicals. In essence, when you purchase a cheap hot tub, you will end up paying for more in the end. Whether it be vinyl repairs, chemicals or replacement parts – the cheaper you go, the more money you end up paying to maintain it. When you purchase a high end hot tub at a discount, you are getting the quality you deserve for your hard earned money. The materials are strong and the components are high quality and state-of-the-art. There is a lot to be said about new technology and efficiency. The best is when you can get an experienced manufacturer that uses the latest techniques and best spa components on the market. If you are considering purchasing a hot tub or upgrading the one you currently own – don’t waste your time and go cheap. When it comes to luxury items, one must consider the entire picture and not just the immediate payment. Everyone knows that quality products are built to last.